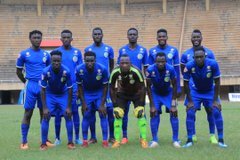 LUGOGO – Ibrahim Juma Dada scored three times as Nyamityobora defeated Police FC 4-1 at the StarTimes Stadium in Lugogo on Tuesday. The 20 year old striker scored two first half goals and sealed his treble at the stoke of full-time to ensure a famous victory for the Abanyakare. Darmien Nakalema scored the other goal for the visitors while Ashraf Ggaliwango grabbed Police’s consolation. After a conservative start by both sides, Juma Balinya had a brilliant opportunity to put Police one up but could not convert from close range while one on one with an empty net. The missed opportunity would soon haunt the Cops as Dada Ibrahim opened the scoring on 21 minutes, slotting in Nyamityobora’s 7th goal away from home this season. Three minutes later, Dada turned provider, setting up Damien Nakalema for 2-0 after the former’s low cross was parried by Police custodian Davis Mutebi. Police responded by taking off Pius Kaggwa and replacing him with Michael Odong as Abdallah Mubiru tried to restore lost order and composure in his team. The switch did not pay dividends however as Nyamityobora scored a third six minutes before the break with Dada beating Sadat Kyambadde and shooting first time into the right hand corner, leaving Mutebi rooted to the spot. By the end of the half, Policed looked dejected as Nyamityobora went into the break leading 3-0. Derrick Kakooza replaced Nyanzi as Police made their second substitution on the day. At the hour mark, Nyamityobora nearly scored a 4th as Nakalema tried his luck from distance but his shot rattled off the cross bar and out for only a goal kick. With 22 minutes to play, Police threw on Ruben Kimera in place of Simon Mbazira in their final switch. Moments later, Balinya had a shot from just inside the box saved by Nyamityobora goalkeeper Otim, off a swift counter attack. On 72 minutes, Jerry Jakisa replaced Peter Otai as Nyamityobora made their first substitution in an attempt to freshen up the tired looking 11 on the pitch. 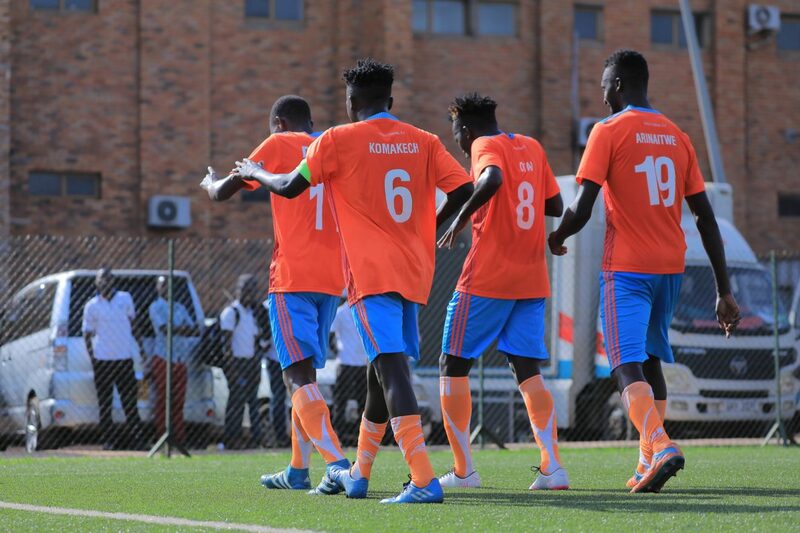 Dada missed a glorious opportunity to score the visitor’s fourth when he lashed onto a throw ball, beat Police goalkeeper Davis Mutebi but his ball across the goal was dealt with by the Police defence. Police’s created a brilliant chance on 78 minutes as Balinya pounced on a loose ball in the 6 yard box but his effort was cleared off the line by Martin Arinaitwe. After the save, Arinaitwe was replaced by Brian Mugisha in the Abanyakare’s second substitution. Five minutes from time, Ashraf Ggaliwango pulled one back for the Cops, heading a corner into the right hand corner to male it 1-3. Moments later, Nakalema become the first player to be booked after he fouled Kimera near the Nyamityobora penalty area. The resultant free-kick would however mount to nothing as Kimera blasted it over. In the final minute of the 90, Dada completed his hat trick, lashing onto a long ball and lifting it over Mutebi into the net to put the result beyond doubt. The win is Nyamityobora’s first away from home this season and their biggest in the top flight. Nyamityobora remain 14th on the log with 12 points from their first 16 games while Police drop to 9th having gathered 21 points so far this season.